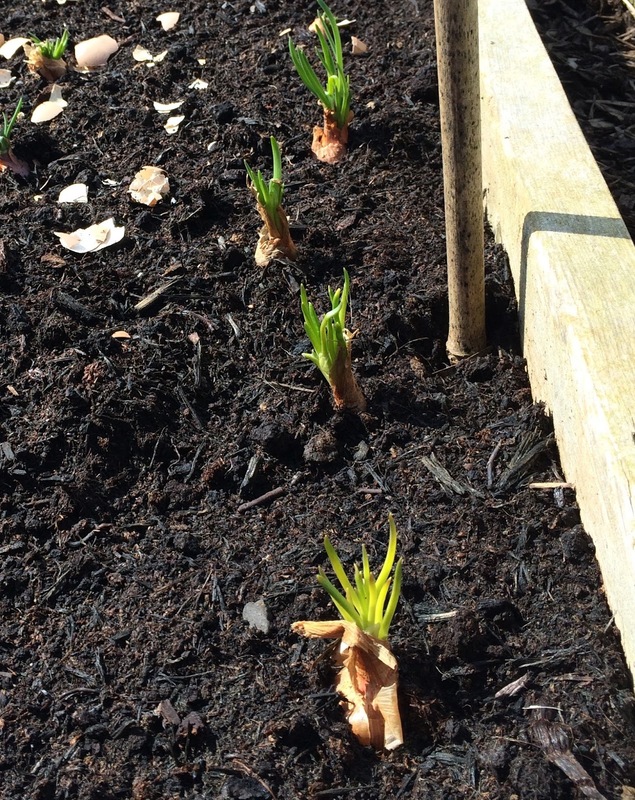 Whilst the rise in global temperatures is truly alarming, as recent months have broken all records ( This February was the warmest in recorded history ), I have risked bringing forward my spring planting by a month. 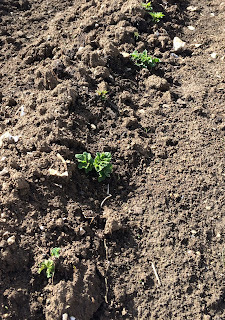 The recommended planting time for my first early potatoes was end of March/April and second earlies April/May, but I planted a row of first earlies at the end of February and a second row at the beginning of March with some second earlies in mid-March. 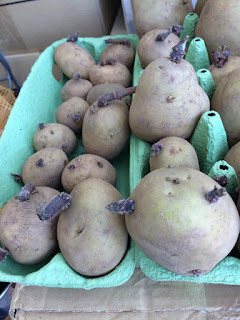 So, either I am looking forward to some very early new potatoes or a total disaster if we see a plummeting of temperature and late frost! With the disruption of building work at home, with our loft conversion, the allotment has not seen as much activity as it should but with a bit of help from Luke and Sylvi we have made some progress. Although our allotment is on the chalky South Downs, we are in a hollow with a heavy layer of clay which is water logged in winter and hard as concrete in summer. Digging in winter is a nightmare as the soil is so heavy and like modelling clay, which is why I have introduced a number of raised beds to which I have added a lot of organic matter - some from the wormery, into which all our kitchen waste goes, and some from the compost bin , together with partially composted lawn clippings and autumn leaves. I think I may need to start a second compost heap of leaves as they take longer to break down. The area where I have planted potatoes, however, is open ground where I grew broad beans and kale last year. 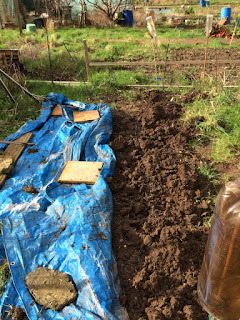 When the area was cleared in late autumn I did spread some part rotted compost and contents of the wormery on the ground and covered with a tarpaulin over the winter. We began to remove the tarpaulin, in late January and then gradually, row by row in February/March. Around the tarpaulin there was an uncleared area with substantial growth of couch grass which had spread its roots and stems under the tarpaulin to join the indigenous bindweed. Clearing the area was a mammoth task, and the challenge now will be to keep it clear with regular weeding. 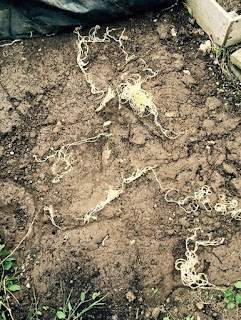 We are also plagued by dandelions which send down tap roots up to a foot in depth which usually break off as you uproot them which means they will grow again! Thankfully, I was assisted by Sylvia and Luke in the digging and weeding. 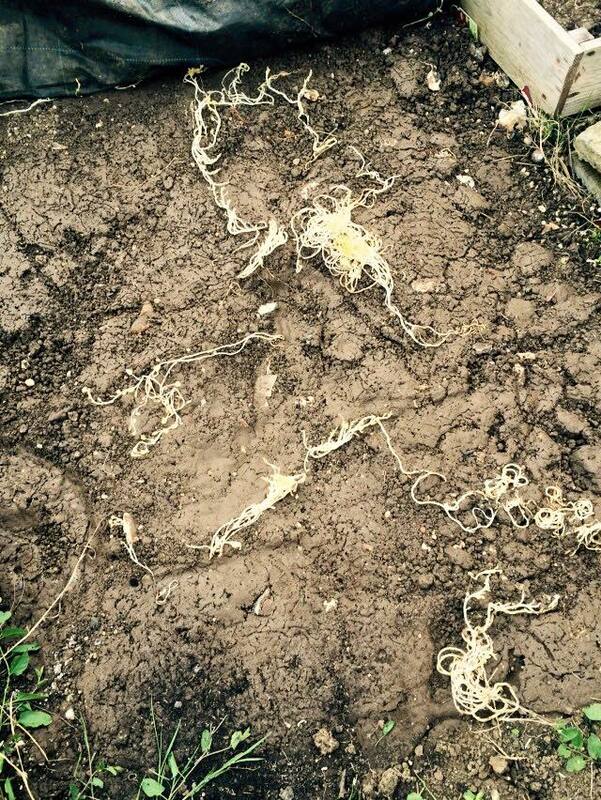 To be fair, we gave Luke some help on his allotment - but quite a different task due to the soil. Luke,s is fairly light soil and if you dig up couch grass or perennial weeds you can shake them and the soil falls off. On mine the heavy clay adheres and has to be removed by hand in lumps - it;s rather like molding potters' clay. Having cleared the area we dug a very shallow trench - about 4-6 inches deep in which we planted the chitted seed potatoes and then covered them with some bought general garden potting compost, earthing them up with the soil removed from the trench. In the last week of February, I planted a ten foot row of First Early Pentland Javelin and in the first week of March a similar row of Arran Pilot - ignoring the instructions that they were to be planted mid to late March. I followed on in mid March with two rows of second earlies, one of Nicola and the other Charlotte. The recommended planting time for these was late March - April, so now it's fingers crossed! When I visited the site in the last week of March, the growing tips of the Arran Pilot were showing through. 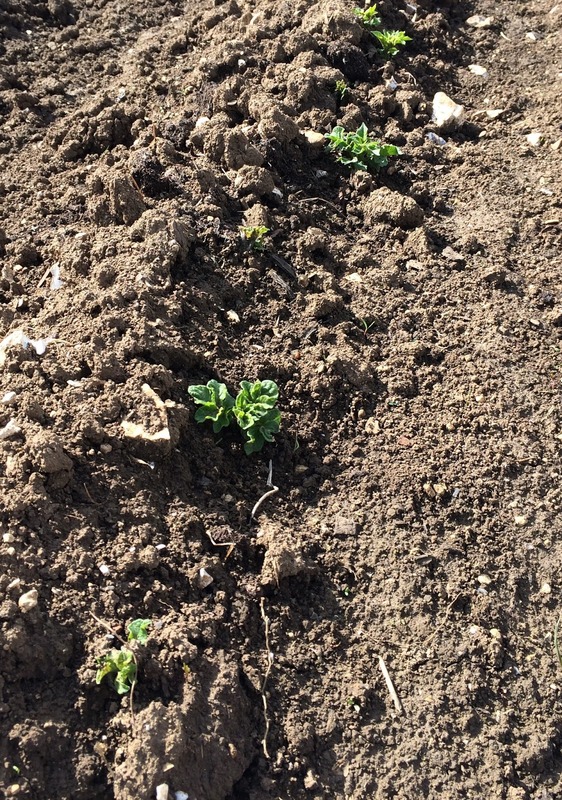 The Broad beans I had sown in November ( a double row each of Aquadulce and the Sutton Dwarf) are about 6 - 8 inches high with some obvious gaps which I have filled with re-sowing. I have also cleared an area next to the potatoes and sown a new double row of the dwarf Sutton and covered with a fleece tunnel. My final act of March on the allotment was to clear one of the raised beds and sow some beetroot (Boltardy) and some Chard before seeking some sunshine in Spain to recharge the batteries before the April sowing season. On my return I was tempted to start some indoor sowing in seed trays of leeks, cavolo nero, early purple sprouting broccoli, pumpkin and courgettes. I am also trying out some rainbow chard (Bright Lights) sown in fibre pots in the cold conservatory. I don't have a greenhouse - and neither does my nephew Bradley (any more); sadly his was taken away by the howling winds of Storm Kate! On the last day in March, I went just for an inspection and was pleased that my tunnel had survived Storm Kate. I also noticed that the first early potatoes planted in February were just peeping through. Which brings me back to where this blog started - climate change?